Ivory is very slick when you’re pulling it through snow. It’s a preferred form of runner. And because ivory is slick on snow and ice, it allows you to move rapidly, pulling whatever you have. A pair of small sleds is needed to pull a whaling umiaq (open skin boat) across the shorefast ice to open water. In the past kayaks were also transported on sleds. 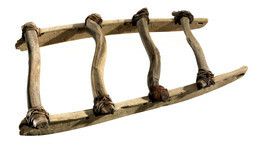 This sled has walrus ivory runners and crossbars made of caribou antler. Ron Brower: On two sides of it, so they can pull up. So that’s what they’re using to pull the umiaq [open skin boat] onto the shore. Aron Crowell: One in the bow and one in the stern? Ron Brower: Yes . . . These are also used by seal hunters in pulling your qayaq [kayak]. There’s two different styles. If you don’t have the dog team, and then you have a long strap, it allows you to pull your qayaq. Kenneth Toovak: Tuugaak [pair of ivory]. Ron Brower: Ivory is very slick when you’re pulling it through snow. It’s a preferred form of runner. And because ivory is slick on snow and ice, it allows you to move rapidly pulling whatever you have. Aron Crowell: So this one has ivory runners, and then it has bone cross pieces? Ron Brower: Yes. Nagruk [antlers]. These are all caribou antler that have been lashed to the runners with sealskin. But this one is modern in that it’s a strip of cowhide leather. It’s been replaced with cowhide.